Shortly after Justin Gaethje watched his friend and teammate Rose Namajunas claim UFC gold last November, the lightweight standout posted a reaction video on Instagram praising the newly minted titleholder, tears streaming down his face as a car service shuttled him through the hectic Manhattan streets. There were no water works this past weekend as he watched Namajunas retain her title in a tense, gripping rematch against Joanna Jedrzejczyk, but there was plenty of nervous perspiration and a text message to their head coach, Trevor Wittman. For the second straight contest, Namajunas delivered a measured, technical performance built on footwork, movement and clean, precise striking. It was a fluid, almost balletic clash and while it didn’t feature a similar crescendo to their first encounter, it was a beautiful return bout between two of the best fighters in the world. If Namajunas is the Bolshoi, Gaethje’s efforts inside the Octagon are the equivalent of an electrified mosh pit inside a dank, subterranean club, all flailing limbs and bodies in motion colliding with a thud as melodic noise shoots out of the speakers. Though he might occasionally dream of performing Swan Lake, the talented 29-year-old knows that when the cage door closes, his thoughts about picking his spots from the outside will be replaced by familiar notions of trading mass quantities of leather in close quarters and chasing down another finish. Gaethje arrived in the UFC with a two-fold mission: to establish himself as the most entertaining fighter in the sport and claim the lightweight title. Through his first two appearances in the Octagon, he’s already completed his first objective, as his bouts with Michael Johnson and Eddie Alvarez took home first and second place in most rankings of the best fights of 2017. They delivered the kind of carnage the Colorado resident promised after moving to the UFC following an outstanding 10-fight run under the World Series of Fighting banner and established Gaethje as one of the elite talents in the ultra-talented lightweight ranks. 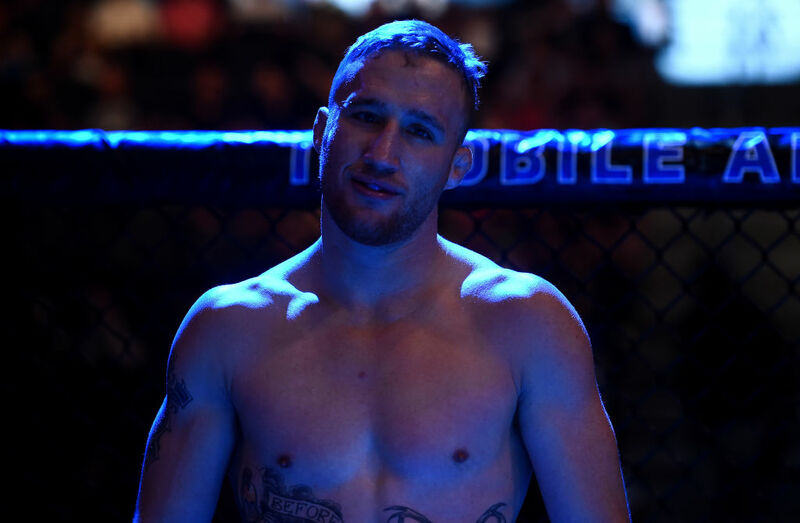 With his bona fides as a must-see attraction clearly established, Gaethje views this weekend’s showdown with Poirier on FOX as a crucial step towards accomplishing his second goal, especially now that things at the top of the division are a little clearer. “This one is a lot more important; it means a lot more to me than I’ve ever felt a fight meant,” he said. “It’s so important as a step in my career because there is finally a little bit more clear path to the title now, hopefully. Getting a win over Poirier is no easy task, as the former featherweight contender has gone 6-1 with one No Contest since moving up the lightweight division. During that time, the Louisiana-bred, Florida-based southpaw has refined his approach in the cage. Once happy to approach fights with the same reckless abandon as Gaethje, Poirier has traded in his willingness to slug it out inside a phone booth with a more patient, calculating style. And though he can still sling with the best of them, the American Top Team representative has also taken to using his wrestling much more and attacking his opponent’s weaknesses, rather than allowing each fight to be a competition to see who can take the biggest punch. Like many before him, Poirier has talked about sticking to his game plan and not getting sucked into a brawl on Saturday night, but that is easier said than done when you’ve got the unrelenting Gaethje pressing forward, occupying your personal space from the opening seconds until whenever the fight finally ends. “It’s funny because he’s had plenty of those himself, on his own accord,” Gaethje said, referencing Poirier’s past slugfests and occasional relapses into being a gunslinger on Fight Night. “I understand watching the countdown, the way that he explains he has a kid now and I know that you look at things differently once you have a kid. “At the end of the day, I’m going to be in his face and I know that he likes to trade in the pocket whenever he’s pushed there. He wants to be patient, but you can’t be patient when I’m in your face the whole time. While Gaethje is always comfortable inside the cage, Saturday’s event also represents a homecoming of sorts for the Safford, Arizona native. As a high school wrestler, Gaethje and his teammates competed numerous times inside what is now the Gila River Arena, the site of this weekend’s UFC on FOX event, and while he doesn’t draw upon those past successes for inspiration, knowing that he’ll be competing in front of a partisan crowd has him excited. “It’s something that if I was a couple years into this UFC run, I would be dreaming about coming home to Phoenix and headlining a card here, but it happened so fast that it’s hard to say it’s a dream come true, but it’s really something special,” he said of competing at home. “I took second twice and won first twice and as a team, we took second my freshman year and then we won first place in state the next three years, so I have a lot of fond memories there – a lot of winning – and I’m going to continue that on Saturday.